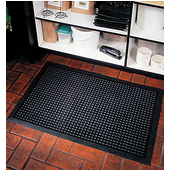 Anti-Fatigue Mats provide added comfort in areas where workers must stand for long periods of time. The mats are made of high-quality, durable materials and are designed to increase circulation in order to eliminate aches and pains usually associated with standing all day. The mats are ideal for retail stores, hotels, hospitals, factories and kitchens.Choose from Front Range, Mat Pro and Wearwell floor mats, which offer an array of styles, sizes and colors to accommodate any room design layout.